Her name was Smoky. She weighed only 4 pounds, stood only 7 inches tall, but she became a certified war dog and served in the 5th Air Force, 26th Photo Recon Squadron in the South Pacific. In February 1944, an American soldier found the young Smoky in an abandoned foxhole somewhere in the New Guinea jungle. The soldiers didn’t know where she came from, but she definitely wasn’t a war dog as she couldn’t understand commands in English or Japanese. They took her back to camp where she was sold to Corporal William A. Wynne for two Australian pounds—all so that the seller could return to a poker game. For the next two years, Smoky and Corporal Wynne became inseparable. With Wynne, Smoky back-packed through the jungles and went on combat flights in the Pacific (she was actually credited with twelve combat missions and awarded eight battle stars). She even became the first therapy dog while visiting injured soldiers in New Guinea. She also saved lives. Wynne taught her how to string communication lines, a taxing and dangerous assignment for humans who would be susceptible to enemy bombings, but not a problem for the 4-pound Smoky. It’s estimated that she saved around 250 crewmen by stringing the lines herself. On their return home, Smoky became a national sensation. After first being featured by the Cleveland Press, Smoky and Wynne went on to live-TV and even Hollywood where she performed various skills and tricks. However, they didn’t forget their roots—Smoky and Wynne spent plenty of time in veterans’ hospitals, performing for injured soldiers. Smoky later died in 1957 at the age of 14, but her heroism wasn’t forgotten. In 1996, Wynne published a memoir for Smoky titled Yorkie Doodle Dandy, and in 2005, a bronze life-sized sculpture was dedicated to her in Australia. 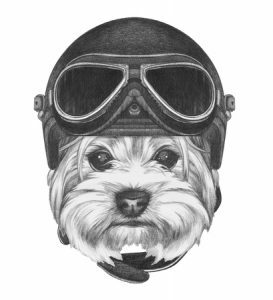 While we can’t guarantee that our Yorkie pups will be flying combat missions over the Pacific, adding a new furry friend to your family will certainly liven up our home. Check out our current puppies to find the dog of your dreams!